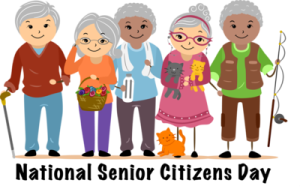 On August 19, 1988, President Ronald Reagan signed Proclamation 5847 declaring August 21 as National Senior Citizens Day. This day was created as a day to support, honor and show appreciation to our seniors. It's also important that we recognize their achievements, afterall, their valuable contributions to our communities create better places to live. Take some time on this day to spend some quality time with a senior you love. This could be your parents, grandparents, aunts, uncles, neighbors or even someone at a retirement community home. Spending quality time and social interaction can have a positive impact on seniors and can improve their physical and mental well-being. Spend quality time with a Senior. Go for a walk, or to a movie, maybe grab some ice cream...but make sure to spend some time with them. As you get older, so do your loved ones and every moment counts! Host a family night. This is a great opportunity to go down memory lane and share old stories. While remembering the good old days you can also create new memories. Some things you can do: cook dinner, tell stories, reminisce about your favorite memories, look through picture albums and even watch home videos. Scout out Senior Discounts. Business owners - offer Seniors a special discount, prize or coupon on this day to show them your appreciation. Volunteer. Visit a local retirement community or nursing home on this day. There may be some seniors that won't be getting a special visit from a loved one, so make their day one they'll remember.